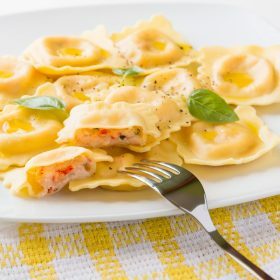 Lobster ravioli is my favorite all-time recipe. 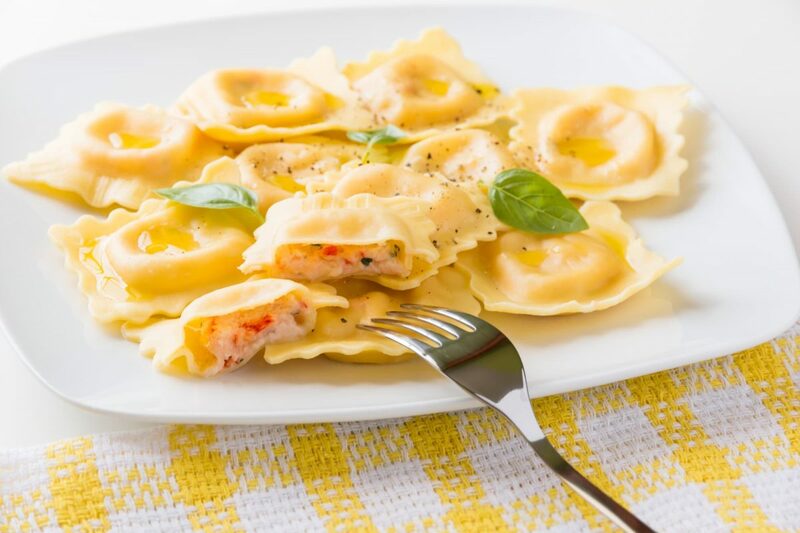 Any ravioli dish is pretty special, little hand made pasta pillows filled with delicious filling, but when filled with fresh lobster, they become the most elegant and luscious dish. My family used to own a restaurant in Italy, named after my Bisnonno’s (great-great-grandfather) nickname, and we served the freshest and most delicious food in town. Luigi was the fisherman that would deliver all the freshest fish caught early every morning, and our menu would change based on what he had caught. 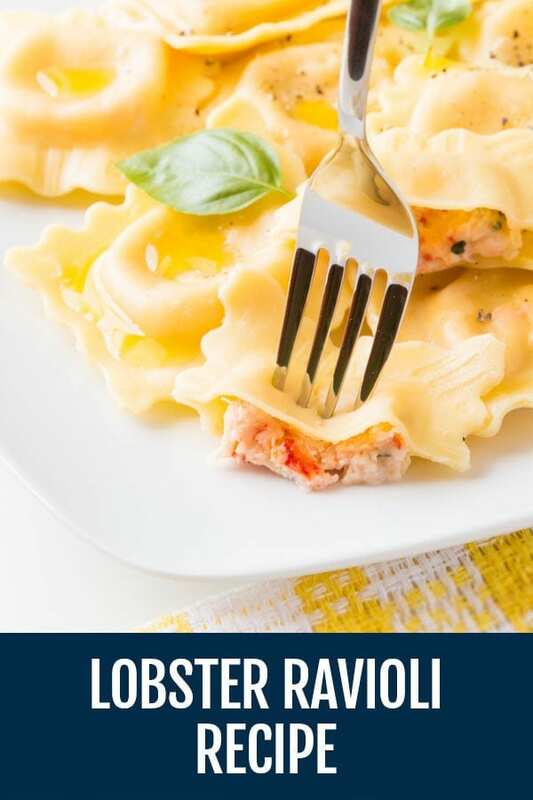 When he would deliver lobster, Nonna would ask him to stay for dinner so he could enjoy his favorite dish of Lobster Ravioli. He would always ask for the recipe and Nonna finally gave it to him and showed him the process of hand-making the pasta and delicious filling. He would always say that someday he was going to open a restaurant and make this dish. I was recently in Italy, in one of the most beautiful coastlines areas in the region of Puglia, and I found Luigi’s restaurant called “Aragosta” which means lobster. After catching up with Luigi, he had the chef deliver the seafood stew of the day to my table. It was so fresh it tasted like the ocean in a bowl. I asked for the famous Lobster Ravioli, and he told me they were not ready yet, and he took me into the kitchen where I saw an elderly lady forming the ravioli just like Nonna did. I was so happy to see that he was using the same care that Nonna had taught him so many years ago. The moment of truth came a few minutes later when Luigi placed the Lobster Ravioli in front of me. They looked and smelled exactly like Nonna’s recipe, and the taste was to die for. I savored each bite as it reminded me of my Nonna and those days in the restaurant, watching her make each ravioli by hand for the guests. It is such a sophisticated dish, I hope you will make Nonna’s famous recipe of Lobster Ravioli for your next special occasion. This recipe is simply a delight, it reminds me of nonna. Heat the oil in a medium saucepan over medium heat add the shallots and sweat until translucent, about 2 minutes. Add the garlic and stir until fragrant, about 30 seconds. Add the white wine and deglaze. Bring to a gentle simmer and add the 4 tablespoons of butter. Stir until melted. Add the basil, parsley and tarragon. Add the lobster pieces and poach in the liquid until almost cooked through, about 2 minutes. Transfer to a food processor and pulse until you get a stiff mixture taste for salt and pepper and set aside. Put one heaping teaspoon of filling on each square, brush water all around the edges of the square. Top with another square and pinch the sides to seal perfectly. Place on a sheet-pan lined with parchment paper and cover with a tea towel until ready to use. Add 2 tablespoons of the reserved liquid and stir. Add cooked ravioli and gently stir to coat.